I concluded my recent DPRP review of Homo Erraticus by stating optimistically ‘I hope that Homo Erraticus does not falter or fall, weighed down by the expectations of past achievements, unnoticed into the pit of indifference’. I looked forward expectantly to see how Homo Erraticus might be transferred to a live setting as it was initially created with live performances in mind. The piece was refined in the studio as an entity to grow and develop further on the stage. Now that it was ready to take the step to a fully fledged live performance, I was confident that it would not disappoint, and, as Bostock might have said, 'I really did not think that I should sit this one out'. In interviews Anderson had promised a theatrical live show and interpretation of Homo Erraticus. In this respect the performance did not disappoint. 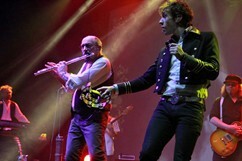 The show began with a tongue in cheek filmed introduction, featuring members of the band, to set the concept. This was soon followed by an enjoyably powerful rendition of the opening track of the album. Any misgivings about the quality of the performance were soon dispelled. The sound was full and rich, the visual backdrop and presentation superbly complementing the unfolding concept of the album. Andersons ailing vocals were once more supplemented sensitively by the warm tones of Ryan O’Donnell. Perhaps most satisfyingly though, the band were energised and seemed to be having a lot of fun! Homo Erraticus has been Anderson’s most commercially successful release for many years. 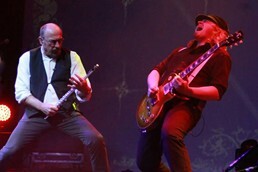 In this context, unfettered by the past achievements of Jethro Tull, the ensemble were adeptly able to bring Anderson’s latest music to life. The tightness and quality of the player’s performance was outstanding. This ensured that the live interpretation of Homo Erraticus exploded rather than crawled out of any perceived pit of indifference that onlookers might have had. Anderson’s obvious conviction in his latest music was apparent in the energy and vitality in which he moved his 66 year old frame around the stage. Equally evident was the rest of the player’s confidence in the nature of the material and satisfaction in being a part of its initial creation and now, replication in a live show. No doubt, by the end of Cold Dead Reckoning any doubters had probably been won over. Immersed in the whole theatrical experience, I know I had. Homo Erraticus, initially conceived as a blind date with the muse, had evolved and was, I felt, much more fulfilling and meaningful in a live setting. The music had the punch and vibrancy that the disappointing production of the release had lacked. The audience reacted and responded accordingly, marking the end of the first set with genuine applause, warmth and enthusiasm. 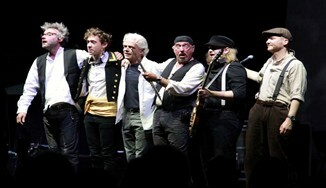 The second half of the concert featuring the best of Jethro Tull was greeted with rapture as David Goodier’s bass began Living In the Past. Whilst the first half of the show was good, the second half raised the bar further. Played in mostly chronological order, a veritable juke box of arguably some of Tull’s best tunes from their eclectic back catalogue emerged. Musically and visually the band was able to capture and interpret the scale and grandeur of Tull’s music. Within a set of many highlights I particularly enjoyed the interpretations given to Teacher, With You There To Help Me, Critique Oblique, Too Old To Rock and Roll and My God. Florian Opahle added many fine individual enhancements to the original guitar parts. His playing never failed to entertain or impress. The way in which his solo in Aqualung was imaginatively constructed was excellent. It was refreshingly different, had great variety and depth but was also respectful to Martin Barre’s outstanding original part. It was refreshing to hear Critique Oblique from A Passion Play and it reminded me of the depth, power and sheer malevolence of that album. Although Anderson appeared eager to downplay this extract from the album, asserting that he felt maybe he “went a bit too far”. To me though, this stood out as testament to a particular side and spirit of his genius which I felt was largely ignored by the rest of this set, particularly due to the absence of Thick As A Brick. How about a one off anniversary performance or tour of “A Passion Play”, Ian? Now that is a show I really would not contemplate sitting out.